The U.S. Central Command has a new rapid-response team which uses information, rather than weapons, to combat terrorism, the New York Times recently reported. Hunting down conspiracy theories and bogus reports on Middle East websites, media outlets and in the social media sphere, the Digital Engagement Team works at "containing lies, misinformation or just misperceptions" about American policy and military actions. Meanwhile, over at the State Department, America's top diplomatic arm is running a companion program targeting young Muslims throughout the world who might be vulnerable to an extremist message. Those international efforts seem to be working, the story indicates. If that's the case, it is time to consider a third program aimed at undercutting domestic radicalization. But instead, authorities are ignoring a major threat that leads to terrorism right here in our backyard. They are not doing enough to sideline Islamist groups like the Council on American-Islamic Relations (CAIR), the Muslim Public Affairs Council (MPAC) and others who propagate the false "war on Islam" narrative. It is a narrative that has proven to radicalize. But instead of aggressively pushing back, the White House, members of Congress and law enforcement routinely engage in "outreach" with these groups, attending their fundraisers and speaking at their meetings. This approach grants legitimacy to groups openly hostile toward American law enforcement and political objectives, shoving aside emerging Muslim voices which take a different approach. This is especially evident with the Muslim Public Affairs Council (MPAC). 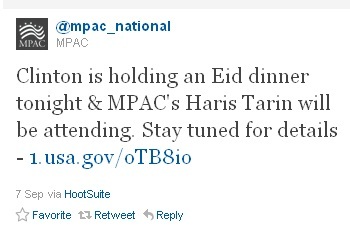 During the summer, MPAC Washington, D.C. director Haris Tarin attended the White House Iftar Dinner, President Obama's 9/11 Memorial at the Kennedy Center, and Secretary of State Hillary Clinton's Eid ul-Fitr reception at the State Department, which was planned to commemorate the conclusion of the month of Ramadan. On July 13, President Obama even called Tarin personally to commend him for his and MPAC's work with the Muslim American community and the nation as a whole. MPAC has also enjoyed a great deal of engagement in its home city of Los Angeles. There, MPAC routinely links up with the LA Sheriff's Department, with which the group has developed a joint counter-terrorism organization and also a cultural awareness training video for law enforcement officers. LA City Council President Eric Garcetti and the Rev. Jeff Carr, Chief of Staff for Mayor Antonio Villaraigosa, have also interacted with the group, most recently at an MPAC press conference in May called to present a unified front on support for the death of Usama bin Laden. MPAC is rewarded despite pushing the "war on Islam" narrative for years and declaring prosecutions of alleged terrorists and their financiers as unjust and unfairly targeting Muslims. Recent months have seen a revival in the organization's public condemnation of U.S. government policies. It took issue with the targeting of radical American-born cleric Anwar al-Awlaki, who was killed Sept. 30 by a U.S. drone strike in Yemen for his role as an al-Qaida ideologue and facilitator of attacks against Americans. MPAC rejected Awlaki's message of violence in a news article on the matter, but challenged "the killing of an American citizen without a trial and due process." It also condemned the United States for opposing a unilateral bid for Palestinian statehood at the United Nations. It issued a policy paper that rejects the notion that Israel be recognized as the "Jewish state," a policy diametrically opposed to the US position. On Sept. 21, the day the paper was released, President Obama told the U.N. General Assembly that "The Jewish people have forged a successful state in their historic homeland." MPAC's paper also casually dismisses significant Israeli offers to bring about a two-state solution and fails to condemn Hamas for vowing to continue its campaign of violence rather than negotiating for peace. This opposition to American policy comes after years of "outreach" from government agencies. MPAC Executive Director Salam al-Marayati attended the 2010 White House Iftar Dinner and MPAC intern Saaliha Khan had the privilege of sitting at President Obama's table. In recent years, MPAC also promoted its formal interactions with the Department of Justice, the FBI, and the Departments of Defense and Homeland Security. MPAC has consistently criticized two of the most significant Palestinian terror-support cases. In 2001, it joined Islamist groups in criticizing the Treasury Department's designation of the Holy Land Foundation for Relief and Development (HLF) for its alleged Hamas support as "succumbing to politically-motivated smear campaigns by those who would perpetuate Israel's brutal occupation" and an attack on Islam. The charity and five former officials were convicted on 108 counts related to a Hamas-support scheme in 2008. "The purpose of creating the Holy Land Foundation was as a fundraising arm for Hamas," said U.S. District Judge Jorge Solis during a sentencing hearing. MPAC also supported convicted terrorist Sami Al-Arian throughout his arrest and trial, claiming that Al-Arian was being unfairly targeted by law enforcement and special interest groups. "Our community is in dire need to understand how these charges [against Al-Arian] are founded on concrete evidence of criminal activity and not guilt by association or political considerations," said MPAC Senior Advisor Maher Hathout following al-Arian's arrest in 2003. Al-Arian eventually pleaded guilty to "conspiracy to make or receive contributions of funds, goods or services to or for the benefit of the Palestinian Islamic Jihad (PIJ), a Specially Designated Terrorist organization." The presiding judge made it clear there was clear and compelling evidence of guilt, despite Hathout's claims. Al-Arian was "a leader of the Palestinian Islamic Jihad," U.S. District Judge James Moody said at Al-Arian's sentencing. "You were on the board of directors and an officer, the secretary. 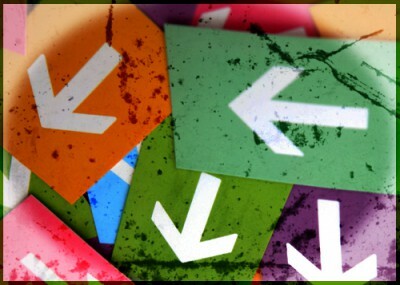 Directors control the actions of an organization, even the PIJ; and you were an active leader." CAIR's Claim of a "War on Islam"
Joining MPAC in both cases was the Council on American-Islamic Relations (CAIR). CAIR officials have pushed the "war on Islam" narrative more than anyone else. They use scare tactics to urge Muslims not to cooperate with law enforcement, push empty conspiracy theories and repeatedly cast any FBI sting operation as inherently flawed. The FBI, they say, is creating terrorists where none existed. While it has been FBI policy since 2008 not to engage in outreach with CAIR, other branches of government continue to grant legitimacy to the group. The FBI's policy is rooted in evidence its agents gathered during the HLF case which placed CAIR's founders, and the organization itself, in a U.S.-based Hamas support network called the Palestine Committee. In October, U.S. Rep. Jim Moran, D-Va., gave a wholehearted endorsement to CAIR at its national fundraising banquet. Members of Congress are staples at CAIR functions throughout the country. Democratic Reps. Andre Carson of Indiana and Hansen Clarke of Michigan attended the CAIR-Michigan banquet in March. Minnesota Democrat Keith Ellison has spoken at numerous CAIR events. In his remarks, Moran lamented what he described as an organized assault on Muslim Americans, including Investigative Project on Terrorism Executive Director Steven Emerson as part of this alleged cabal. "But the facts are, as [CAIR Executive Director] Nihad [Awad] said, we are dealing with a very well-funded and highly organized effort to distort Islam and to frighten non-Muslims into identifying a whole faith with violence and extremism." He claimed that "CAIR has been a leader in decrying terrorist violence and working with law enforcement to fight religious extremism." CAIR's record tells a far different story. In Minneapolis, it has attacked Somali Muslims who cooperate in a law enforcement investigation into young men who have disappeared from the area, only to turn up in Somalia as part of the al-Shabaab terrorist group. Its San Francisco chapter posted a flier in January urging Muslims to "Build a wall of resistance" and "Don't talk to the FBI." Meanwhile, CAIR-Michigan Executive Director Dawud Walid has traveled twice to Mali for the State Department to "build religious and cultural ties between American religious and civic leaders with Malian counterparts." In his most recent trip, he described America as "one of the world's most tolerant societies regarding religious expression and practice." But he also slammed American treatment of American Muslims, saying they have been improperly profiled by law enforcement since 9/11. In doing so, he invoked the case of Detroit Imam Luqman Abdullah, who was killed after firing first on FBI agents as they moved to arrest him on a criminal complaint. Abdullah, Walid said, "was shot 21 times including twice in the back during a raid by law enforcement agencies based upon an investigation of his mosque, which ended up proving no links to terrorism or treason." The growth of homegrown terrorism is beyond dispute. And most cases, especially those aimed at American military targets, are rooted in the terrorist's belief that America is indeed at war with Islam. The serial killings at Fort Hood, followed by an unsuccessful bombing plot there, were triggered by the attackers' desire to avenge the death of Muslims abroad, or prevent troops from going to war zones. Five young men from Northern Virginia are serving 10-year sentences in Pakistani prisons after disappearing and trying to join the jihad against American troops in Afghanistan. They attended a mosque connected with the Islamic Circle of North America, a group which offers a curriculum featuring books by a series of radical Islamist ideologues, some of whom are considered inspirations to terrorist groups from Hamas to al-Qaida. Islamist groups including CAIR promised to develop anti-radicalization programs of their own after one of the young men, Ramy Zamzam, left behind a martyrdom video before leading his friends to South Asia. But those have not materialized. The homegrown terror cases have reached a volume where the broken windows theory of law enforcement and sociology applies. The theory is based on a neighborhood blight premise – that broken windows are indications no one cares and bad behavior is unchecked. Fix those broken windows; show a commitment to a safe community, and crime decreases. In America, young Muslims have seen more than 20 Somalis disappear from their Minneapolis-area homes to join al-Shabaab, an al-Qaida affiliate waging a brutal war in Somalia. They've seen Samir Khan, killed in September alongside Awlaki in an American drone strike publish terror-supporting rhetoric on the Internet before becoming a leading propagandist for al-Qaida in the Arabian Peninsula. In a rant made during his October 2010 guilty plea, failed Times Square bomber Faisal Shahzad described "the war against people who believe in the book of Allah and follow the commandments, so this is a war against Allah. So let's see how you can defeat your Creator, which you can never do. Therefore, the defeat of U.S. is imminent and will happen in the near future, inshallah (God willing), which will only give rise to much awaited Muslim caliphate, which is the only true world order." In a letter to the court, Carlos Bledsoe, who converted to Islam while in college and answers to the name Abdulhakim Mujahid Muhammad, wrote that his shooting attack on an Army recruiting office in Little Rock was an act of Jihad. "I wasn't insane or post traumatic nor was I forced to do this act, which I believe and it is justified according to Islamic Laws and the Islamic religion," he wrote. "Jihad – to fight those who wage war on Islam and Muslims." We cannot wait for the Islamists who pushed the same theme to come up with an answer. "You've heard of the Iron Curtain, of course," Ardashir Safavi, who works for the Centcom team, told the Times. "We're here to pierce the Electronic Curtain because the military has decided that it cannot cede this information space to violent extremists." The same should apply to domestic radicalization and combating the war on Islam narrative. It starts with the Islamist groups who carry the biggest megaphones.